TS EAMCET Result (तेलंगाना ईएएमसीईटी रिजल्ट) 2017: We are here to make the candidates aware of the updates that are made by the JNTU Hyderabad on behalf of TSCHE. As per the notification, the candidates who have appeared in the TS EAMCET entrance exam 2017 that was conducted on 12th May 2017 will now need not to wait anymore for checking their Telangana EAMCET Result 2017. As the JNTU has prepared itself completely for releasing the scorecard of TS EAMCET 2017. The candidates will be able to check their TS EAMCET 2017 Result on 22nd May 2017. Just after the exam conduction on 12th May, candidates will be able to check their TS EAMCET Primary Answer Key 2017 on 13th May 2017. After that, if any of the candidates is having any objections about the answer key then they raise their objections until 18th May 2017. 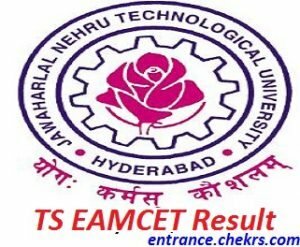 Jawaharlal Nehru Technological University is all set to release the Telangana EAMCET Result 2017 in the next few upcoming days. As the TS EAMCET 2017 has been conducted on 12th May and the answer key for TS EAMCET can be checked on 13th May onwards. Candidates who have been successfully appeared in the entrance exam will be able to check their TS EAMCET 2017 Result/ Scorecard on 22nd May 2017 from the official website of TS EAMCET 2017. We have provided the complete procedural steps to check the Result of Telangana EAMCET 2017. Go through the TS EAMCET official website, i.e. eamcet.tsche.ac.in/. Search for the Result link in the Menu bar or the notification section. You will be shown with a request box after clicking on the given link. Enter the Roll No. & DOB in the shown request box. You will get the TS EAMCET Scorecard on your system screen after clicking on the “Submit” button. Candidates will be made with the Primary Answer Key of TS EAMCET 2017 just after the conduction of the entrance exam. As the TS EAMCET 2017 entrance exam will be conducted on 12th May and the primary answer key will be released on 13th May 2017 for all the candidates who have appeared in the exam. If any of the candidates have any objections with any of the question then they can raise their answer key objection until 18th May 2017. Just before the declaration of the result, candidates will be made available with the category wise TS EAMCET Cutoff Marks 2017 and after that, the result of Telangana EAMCET 2017 will be released online on 22nd May 2017. Then the candidates who qualify the TS EAMCET Cutoff, their names will be displayed in the TS EAMCET Merit List 2017. Then the candidates will be called for the counselling and then the seats will be allotted to the candidates in various colleges as per their score and the choices filled in the counselling form. Jawaharlal Nehru Technological University will release the TS EAMCET Result 2017 on 22nd May for the entrance exam that is conducted on 12th May 2017. We have made you available with the complete step wise procedure as well as the direct link from where you can easily access your TS EAMCET Scorecard 2017 just by simply entering some basic details in the shown request box. For any type of assistance, while checking the Telangana EAMCET 2017 Result, candidates are advised to contact our experts by leaving their comments at the end of the post.